Our Canadian Rockies round-trip train tours provide the maximum value, convenience and beauty available, with no back-tracking. Travel from Vancouver to Banff, Alberta, and back again on one of our Rocky Mountaineer trains. You are sure to have a comfortable journey surrounded by elegance when you travel through the Canadian Rockies by train. Spend a glorious eight days making a complete circle around the Canadian Rockies. Board the ViaRail Canadian in Vancouver and travel to Jasper National Park, where you will see the Jasper sights and tour of the Columbia Icefield. This package includes a night at the magical Chateau Lake Louise, a night in Banff, and tours of Yoho Park and Emerald Lake. Experience the best of the Canadian Rockies with your own private bedroom on the train, as well as access to a lounge, a club car, a dining car and observation cars. 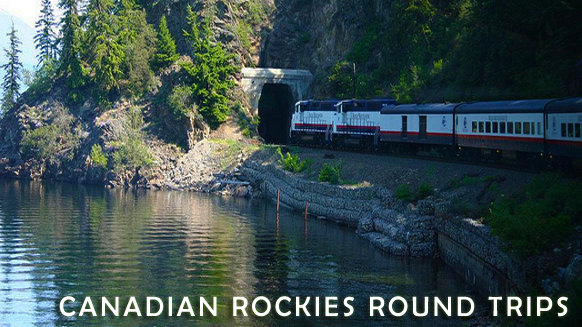 This Canadian Rockies round trip train package includes sightseeing by train and by car. Spend one night in Vancouver, Kamloops, two nights in Jasper, one night in Banff, a night in Kelowna and a final night in Vancouver. Learn useful and entertaining information with our Gypsy Guide tour system! Our only round trip to and from Calgary! Includes two days on the Rocky Mountaineer from Calgary to Vancouver. Enjoy a full-day tour of Vancouver, a night and a day on the ViaRail train from Vancouver to Jasper, a private bedroom on the train, overnight stays in Jasper, Lake Louise and Banff, and tours of Columbia Icefield & Yoho National Park. Available each Saturday from May 5 to September 30, 2012. Length: 7 Nights, 8 Days.